In order set up Google Apps on your domain, you must first disable the email service for that domain. 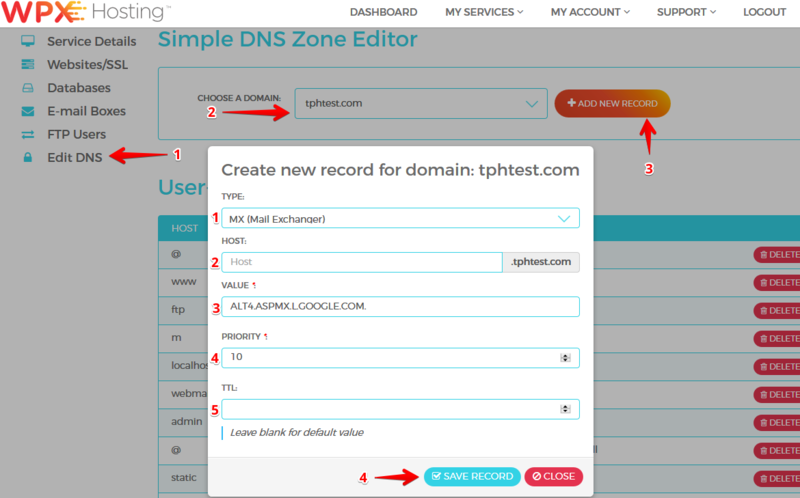 You can do this from the Websites/SSL (1) tab in your Hosting Panel, then clicking on Settings for the domain in question. 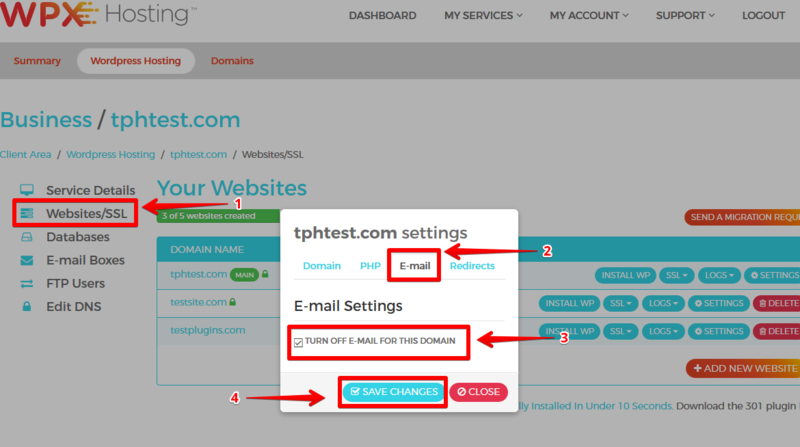 In the pop-up menu, select E-mail (2) and check the box to turn off e-mail for this domain (3). Once you're ready, Save Changes (4) to proceed. Important: This will remove any email accounts associated with that domain (hosted with us) along with any email messages in them! When the email service of your chosen domain has been disabled, you can proceed to make changes to DNS. First, you will need to add the MX Records for Google in the Edit DNS menu of your Dashboard. Note: You must add all 5 of these MX record values into the DNS Zone Editor. Type (1): Choose MX Mail Exchanger from the drop-down menu. Host (2): Leave this field blank. Value (3): Input ASPMX.L.GOOGLE.COM. as the MX Record value here. Priority (4): Set the priority to 1. TTL (5): Leave this blank for default value. Once you have filled in these fields, click Save Record (6). Value (3): Input ALT1.ASPMX.L.GOOGLE.COM. as the MX Record value here. Priority (4): Set the priority to 5. Value (3): Input ALT2.ASPMX.L.GOOGLE.COM. as the MX Record value here. Value (3): Input ALT3.ASPMX.L.GOOGLE.COM. as the MX Record value here. Priority (4): Set the priority to 10. Value (3): Input ALT4.ASPMX.L.GOOGLE.COM. as the MX Record value here. DKIM type records as a verification method. You can also visit our Facebook page (and see more feedback from our community here). Learn more about our WordPress hosting in Netherlands. More details on how Google Apps set up, could be read on our WordPress Hosting in Brazil (check out our website here).